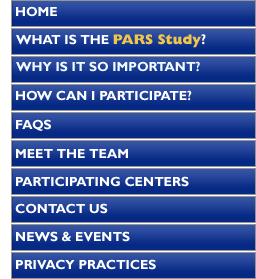 What is the PARS study? The PARS study aims to screen over 15,000 individuals (PD relatives and non-relatives). The specific goal of this study is to evaluate specific tests to see if we can detect whether the testing can detect early signs that may be predictive of an increased risk for Parkinson disease. The initial test to be evaluated in this study is the UPSIT (University of Pennsylvania Smell Identification Test), which is a test of the sense of smell. Loss of smell is a common first symptom in people with Parkinson disease. In Parkinson disease, the decrease in the sense of smell frequently occurs prior to the onset of motor symptoms. By using smell testing in combination with other tests we hope to develop a system to detect Parkinson disease before it starts. Individuals that are willing and eligible to participate in this study will receive a smell test and a brief questionnaire in the mail. After the smell test and questionnaire is returned by mail to the PARS research team, participants may be asked to visit the study center which is geographically closest to where they live. At this visit participants will have an evaluation by one of the study investigators. In addition, participants may be asked to travel to New Haven, CT to undergo brain imaging. If you are asked to undergo a clinic visit or brain imaging, all travel expenses will be arranged and paid for by the study.